Amontillado is a sherry, whereas rioja is a fruity red, but they can certainly serve the same purpose. There have been a few adaptations of the Edgar Allan Poe story over the years, but Vincent Price and Peter Lorre still probably claim the most iconic take in Roger Corman’s Tales of Terror. 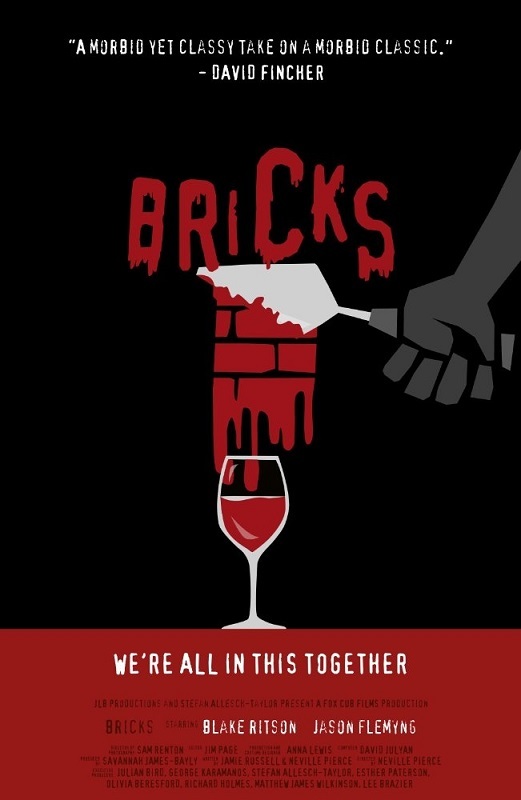 However, Neville Pierce updates and crystallizes the Poe classic quite distinctively in Bricks (trailer here), one of three of his recent short films releasing today on Vimeo VOD. Clive is a tradesman renovating the wine cellar of William, a well-heeled country gentleman. Of course, he doesn’t think that makes his employer any better than he is. Perhaps a little deference would have been advisable in this case. Anyway, enjoy the rioja. Blake Ritson and Jason Flemyng are quite a well-known duo to appear in a shot film, but Bricks was probably too much juicy fun to turn down. Ritson is delightfully twitchy and villainous as William, fully in keeping with the Poe-Lorre tradition. Likewise, Flemyng is believably but tragically oblivious to the danger of his situation, rather blinded by his egalitarian workman’s pride. It all looks spot-on, thanks to a perfect set and Sam Renton’s darkly evocative lensing. In the case of all three shorts hitting VOD, Pierce collaborates with scribe Jamie Russell, who has sole screenwriting credit for Ghosted (trailer here). Flemyng also returns in a supporting role, but the lead is clearly Alice Lowe, an emerging genre star, thanks to Prevenge, Sightseers, and The Ghoul. 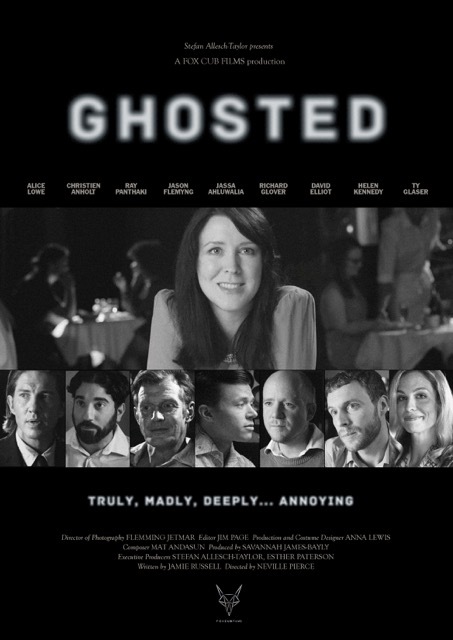 This is definitely a lighter film from her, but she is terrific as Rebecca, a widow, who has the ghost of her philandering late husband tagging along on her internet-arranged dates. The premise is reminiscent of Robert Mulligan’s under-appreciated Kiss Me Goodbye, but it has a really endearing twist at the end. It also looks great, thanks to Flemming Jetmar’s stylish black-and-white cinematography. That leaves the competent but disappointing Lock In as the weakest of the trio. Pregnant Lucy is alarmed when an agitated young man barges into her former teacher father’s public house at closing time, accusing him of unspeakable abuse when he was a student. They go into full barricade mode fearing an attack from his mates outside, but in cinema today, an accusation of molestation is tantamount to proof, so we know it is just a matter of time before Lucy starts to suspect the worst. It is all pretty predictable, but at least Lucy Boynton, from Blackcoat’s Daughter and Murder on the Orient Express is quite good as her namesake. So, two out of three is pretty good, especially when the third is sure to have its kneejerk defenders. Fortunately, the two with the most genre appeal really are a lot of jolly fun. Bricks will delight old school fans of Vincent Price, while Lowe’s fans and general audiences will be charmed by Ghosted. Very highly recommended, they both launch on Vimeo today, along with the comparatively less interesting Lock In.